THIS ARTICLE WAS WRITTEN IN COLLABORATION WITH VOVPH AND SASS ROGANDO SASOT. Since the start of the Duterte Presidency, the opposition and their numerous allies in mainstream media have demonized Duterte-aligned social media personalities, accusing us of being part of some well-oiled, large-scale propaganda machine, an allegation that they have so far failed to substantiate. Leading the pack is Rappler CEO Maria Ressa, and her best evidence against us is some testimony from a single anonymous source, which I find utterly pathetic. And all the while, they have been turning a blind eye on anti-government, Liberal Party-aligned pages such as Madam Claudia, SilentNoMorePH, ChangeScamming, and the relatively new Pinoy Ako Blog. So just like what my friend Sass Rogando Sasot and I have been doing since god-knows-when, let us do what mainstream media wilfully neglects to do: investigate these pages and see if there’s a puppeteer behind them. Note that I am not against anonymous blogs, as I was once the most notorious anonymous blogger in the Philippines. However, I made sure that I did not break laws with whatever I write, something that the anonymous blog SilentNoMore PH cares little about. I wanted to be anonymous because I do not want fame. However, some appear to stay anonymous, not to evade the limelight, but to evade accountability. A few days ago, SilentNoMore PH called majority bloc senators “Malacanang Dogs” for not signing the Senate Resolution calling for an investigation on alleged extrajudicial killings in the country [TV5]. The problem? These seven senators were not even notified that there was such a senate resolution to begin with. That is, they cannot possibly say no to a question that was never asked to them in the first place. All seven senators are visibly incensed over SilentNoMore PH’s irresponsible post, with Senator Sotto even planning to file cyber libel cases against those behind the social media entity. But there’s a problem: Who are behind Silent No More PH? And that’s what I’ll try to answer, and more. In April 2016, I published “#BangkoSerye: Sonny Trillanes and his Hacker-Friend”, where I successfully uncovered self-proclaimed hacker and Magdalo member Bem Pontejos as the administrator behind EllenTordesillas.com. I did that using a simple WhoIs lookup, which basically shows the contact information of a website’s registrant, administrator, and tech contacts. WhoIs lookups, however, do not always work because of domain privacy services, or paid services that allow website owners to hide their identity by using third-party contact information in lieu of their own. In the BangkoSerye issue, Bem Pontejos immediately subscribed to domain privacy services from WHOISGUARD to hide his details, even if it was already late. Unfortunately, SilentNoMore PH also has domain privacy protection, with its registrant, admin, and tech contacts showing as “Contact Privacy Inc.”, which is obviously a domain privacy services provider. Hence, WhoIs won’t be very useful in unmasking SilentNoMore PH (SNM PH). Serving Google Adsense advertisements, such as the one seen below, is the most popular way to earn money from a website. SNM PH’s website silentnomore.ph has such advertisements. So let’s ask: who’s earning money from SNM’s website? The funny thing about Google Ads is that Google requires site administrators to verify their identity and physical addresses before they are even allowed to insert ads in their websites. Google verifies addresses by sending snail mail containing a passcode to administrators. Upon receiving the letter, the administrators use these passcodes to activate their respective accounts. This makes the process very tedious for residents of countries like the Philippines since the letters are usually mailed from the United States. For example, it took me three months before I received my Google Adsense letter, and only then was I able to serve ads on ThinkingPinoy.net. Thus, it’s not impossible for ads served on SNM’s website to originate from a Adsense account that’s also used by other websites. Now, Google Adsense source codes, when inserted into a web page, show the ad’s Google AdSense Publisher ID. The Google Adsense Publisher ID is a unique numeric identifier for a Google AdSense Account. Thus, knowing who’s behind SNM is just a matter of getting the Publisher ID in SNM’s ads and comparing it to the publisher IDs of sites whose owners are already known. Why? Because it’s the owner of the AdSense Account who financially benefits from all the Google ads served using that account, regardless of what website those ads are served. Surely, no moron will allow others to steal earnings from his own website. If I were a website owner, why would I let my site’s ad earnings go to somebody else? Press CTRL+F (find tool), type “ca-pub”, and press enter. The number immediately succeeding “ca-pub”, which is “pub-8283971809912134”, is the Google AdSense publisher ID of whoever owns or controls SilentNoMorePH. With the publisher ID already known, it’s now just a matter of finding other websites whose administrators are already known and whose Google Ads feature the same publisher ID. Using the same process of finding publisher IDs, we found out that the ads served on ProPinoy.net also feature the same publisher ID “pub-8283971809912134”, as shown below. But it doesn’t end there.Madam Claudia’s site ads also use the the publisher ID “pub-8283971809912134”, as shown below. In short, Cocoy Dayao, the Chairman and Editor-in-Chief of ProPinoy.net, also owns or controls the websites of SilentNoMore PH and Madam Claudia, websites whose content are shared in their respective Facebook Pages. 1: WeSupportBamAquino.com - pro-Bam website that attacks critics of Bam Aquino. INTERESTING. DOES BAM AQUINO HAVE A HAND IN ALL THESE? 2: ThinkingMillenialsPH.com - a site that focuses on attacking pro-Duterte bloggers, all are anti-Duterte posts. 3: PulisPatola.com - a fake news site that focuses on attacks against the credibility of the police force. We’re already here anyway, so we might as well check other anonymous websites and see if they’re also owned or controlled by Cocoy Dayao. Now, Sass Rogando Sasot has earlier shown that Cocoy Dayao is the administrator contact of Pinoy Ako Blog (PAB), which PAB later acknowledged in a blog post [PAB], though PAB claims that Dayao is just a webmaster (administrator) and not the actual content creator behind PAB. Regardless, what’s clear here is that Cocoy Dayao is the administrator not only of PAB, but also of Backroom Politics and ChangeScamming. If Dayao sees nothing wrong in being a potential accessory to a crime, then that’s his problem, not ours. But wait... there’s more, a lot more! 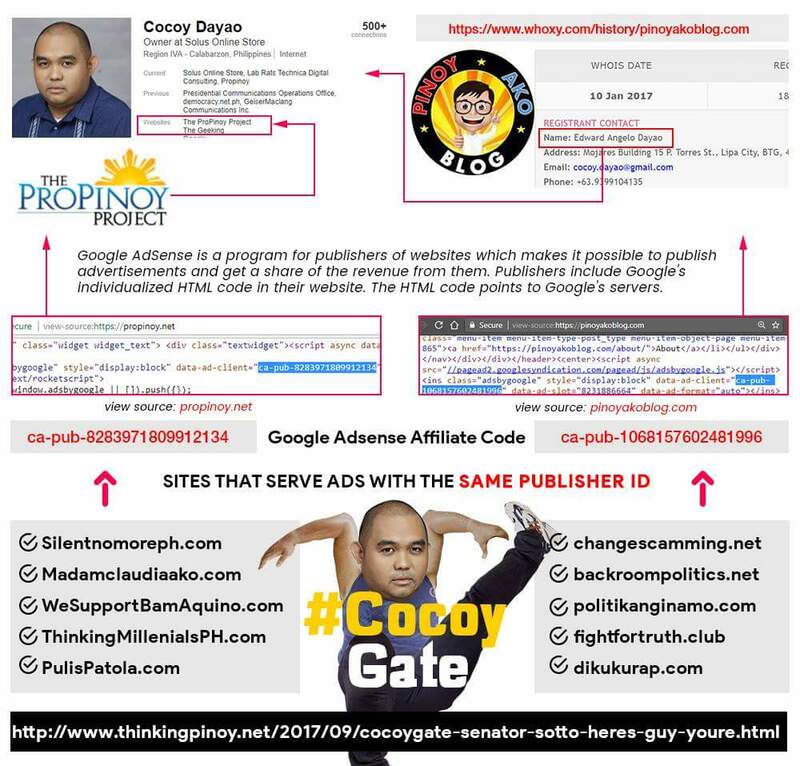 It appears that Cocoy Dayao owns or controls six sites so far, but a more comprehensive search shows that Dayao owns or controls many other fake news sites. Using a paid TCPIPUtils.com subscription, I checked for sites using the two Google Adsense Publisher IDs linked to Dayao. TCPIPUtils is a “freemium service”, or a service that can be used for free, but whose features are limited unless a user has a paid subscription. Aside from ProPinoy, Madam Claudia, and Silent No More, three other websites with one being twentyeightfourteen.com, where the [about page] is a writeup about Cocoy Dayao, suggesting that Dayao owns or controls this site. anunabes.com - a supposedly hip news site whose associated facebook page didn’t pick up steam and thus was apparently abandoned. dotreport.org - an seemingly abandoned and generally oppositionist opinion blog. duterteadminnews.com - an apparently pro-Duterte site but its Facebook page got only 92 likes, suggesting that whatever Cocoy’s plans here were abandoned. There are only 4 posts. fightfortruth.club - supposedly a fact checking site, although it focuses only on fact checking obviously fake news sites using a clear anti-administration bias. Updated once a week. FixPH.org - another fake news site that called Senator Gordon a “d*ck” as it accused the senator of conniving with Sen. Pimentel in a power grabe against Sen. De Lima. kolektibo.com - a seemingly abandoned pro-Duterte site. PilipinongPalaban.com - a staunchly pro-Leni site. No traction though. Yeah, that’s a lot, and I am only talking about those websites that I was able to find. How many more does Cocoy Dayao own or control? 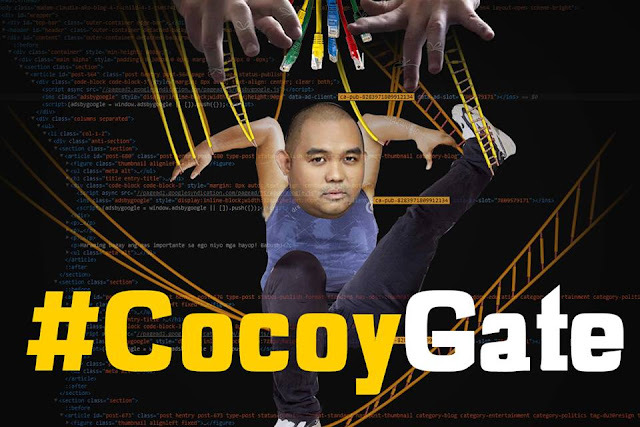 Dayao, in his LinkedIn and [UpWork] profiles, calls himself the “Chief Technical Officer” of a certain “Lab Rats Technica Digital Consulting”, a Lipa-based single-proprietorship IT services firm and at this point, it is clear that Cocoy Dayao is involved in these sites in a significant capacity. We still have to verify if he himself creates some or all of the content for these sites, or if he has associates who help him with it. However, I am inclined to believe the latter because the sheer number of these websites and their varying tones of writing suggest an organization behind the effort as opposed to just one martyr. Does Dayao do this for love of country, or does he have other motivations? According to his linkedin account, he was a PCOO consultant from 2012 until PNoy stepped down in June 2016. Besides, he does web programming and development for a living. Dayao is not that smart, as evidenced by his monumental carelessness that led to the creation of this article. Thus, it’s not unlikely that there’s someone behind him who’s calling the shots, who’s providing the funds. Being the administrator of several fake news sites, Dayao should be invited to the October 4th Senate Hearing on Fake News so the Senate can find out who the brains and the money behind this Liberal Party Propaganda Machine. Who knows, this might actually be the well-oiled, well-funded propaganda machinery that Maria Ressa has been talking about? Has Ressa been barking up the wrong tree the entire time?